You Brought Naomi Freeman Home for Christmas! Thank you again for all of your support for Naomi and her family. If you are interested in continuing to support Naomi as she fights her case, please contact Moms United Against Violence and Incarceration by emailing Holly at holly.krig@gmail.com. To donate to help the Chicago Community Bond Fund continue, sign up for our mailing list, or learn more, you can vist our site. On July 5, 2015, Naomi Freeman chose to survive. Naomi is a 23 year old Black woman from Chicago and the mother of 1 and 2 year old children. In choosing to survive that day, Naomi Freeman unwittingly joined the ranks of Marissa Alexander, Cierra Finkley, Cherelle Baldwin, Paris Knox, Tewkunzi Green, Eisha Love, and many women who made the split-second choice to survive rather than die at the hands of an abuser. Also like them, she was arrested for it. Some of these women are still awaiting trial while some are already serving decades in prison and seeking clemency. Marissa Alexander, however, avoided her initial 60-year sentence after successful public pressure and fundraising support. Cierra Finkley was also released after her charges were dropped. Naomi should be free as well, and can be with your help. Like many of the women named above, Naomi chose to survive an attack by an abusive partner. We know from Naomi and other eyewitnesses that Naomi was pulled from a vehicle by her hair and slammed to the ground. Once on the ground, Naomi was beaten and punched in the face no fewer than 20 times. During this assault, Naomi was in the early stages of pregnancy and suffering a chronic autoimmune disease that affects her joints. Sadly, this was not the first time Naomi had been assaulted by this man. Had Naomi not acted in self-defense, it is likely that she would be dead. Instead, like many other women and girls incarcerated right now, who are disproportionately Black, she survived and was punished for it. 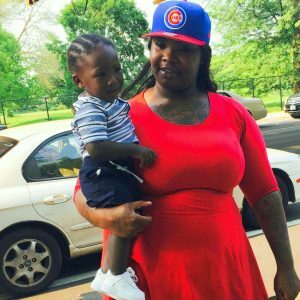 As of December 8th, Naomi has been in Cook County Jail for nearly 6 months. Naomi’s pregnancy is complicated by Lupus and the ongoing traumas of pre-trial detention and separation from her two young children. For saving her own life, Naomi Freeman is being charged with 1st-degree murder and is being held on $350,000 bond (reduced from $500,000). It is our intention to support Naomi by working alongside her family to advocate for the dismissal of these outrageous charges by Cook County State’s Attorney Anita Alvarez. Right now, though, Naomi urgently needs $35,000 cash to secure her release from the jail that will mean: a return to her children, proper maternal health care, and the best possible position to assist in her own defense. Her family is working hard to raise this money by pooling their limited resources and doing fundraising dinners, but $35,000 is far more than most people ever see at one time. Right now, we ask what can you do in solidarity with Naomi, her children, and family? What can you do in solidarity with all the women and girls criminalized for self-defense who are denied the right to survive by a system that perpetuates all forms of violence? Will you donate what you can? Will you encourage others to donate and share with their own networks? Please stand with Naomi and the family that supports her with love and what little resources they have. Please bring Naomi back to her very young children, who ask about her every day. Join us and #FreeNaomiFreeman before Christmas.